Oxley hasn’t slowed down after selling hosting business. When HostGator founder Brent Oxley sold his company to Endurance International Group in 2012, he did what a lot of entrepreneurs in Texas do after selling a business: he bought a ranch. Oxley found his new home in an 18,000+ acre ranch about two hours west of San Antonio in Uvalde, Texas. But unlike many people who cash in on a big sale, Oxley isn’t slowing down with his entrepreneurial endeavors. Not only is he churning out more internet businesses (more on that later), he has also turned the ranch into a business. I traveled to Ox Ranch this past weekend to see what Oxley has developed on the massive property. As I entered the ranch, I saw dozens of small animals on both sides of the road. About a quarter of a mile later I was suddenly surrounded by much larger animals: giraffes. 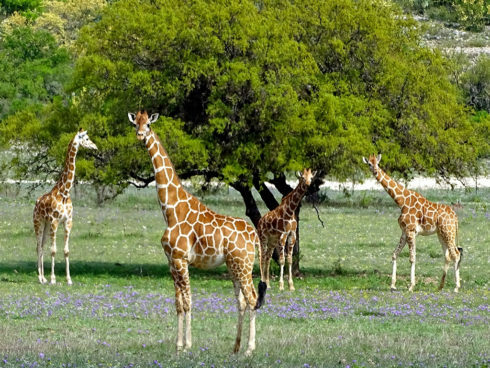 The ranch is home to dozens of exotic animals including wildebeest, buffalo and camels. Although my attempts to feed the giraffes failed, it was still remarkable to get so close to these animals. Seeing the animals was nice. But what I really came to the ranch to experience was driving a tank. Oxley set up a business with a domain name that DNW readers will appreciate: DriveTanks.com. The ranch has nine tanks (and growing) that you can drive. Many of the tanks can be shot as well. I chose to drive an Abbot FV433 through the tank course, which traverses a steep decline and creek. That’s me driving a tank at Ox Ranch in Uvalde, Texas. If driving a tank isn’t enough to get your juices flowing, you can also crush a car in a British Chieftain tank and shoot a live round from one of the tanks. That’s not me in the picture. Watching from thirty feet away was close enough for me. Ox Ranch has a number of overnight packages available with stays in its luxury cabins. There’s also an airstrip if you prefer to fly in than to make the drive. While developing an 18,000 acre ranch must be a full-time job, Oxley is still working on building internet businesses. Two of the companies he’s working on right now have excellent domain names. Help.com is an Austin, Texas-based customer support system. Oxley is also working on launching a real estate site on the category-killer domain Realty.com. He bought the domain for seven figures. The post HostGator founder Brent Oxley loves great domain names. And driving tanks. appeared first on Domain Name Wire | Domain Name News & Views.